When I think of traveling during the holiday season, images of Macaulay Culkin, and the rest of the McCallister family crew feverishly packing and sprinting through the airport, come to mind. This Christmas, Santa isn’t the only one catching a flight. Don’t let the overly-optimistic people in your life fool you when they assure you that “No one is flying on Christmas.” In fact, this year airlines expect 42 million passengers to fly during the Christmas-period, with December 21st, 22nd, and 23rd being the busiest days. Whether you’re trying to escape the “side show” that is your family, or rushing to see your loved ones, we’ve got you covered. In this week’s Apps on Tap, we’ll review three travel apps that are sure to get you safely home this holiday season. For travelers planning to spend the holidays abroad, we’ve got the perfect app for you. Spending Christmas in Paris sounds like a dream come true, until you find yourself anxiously flipping through your translation book only to find that the word you’re looking for doesn’t exist. Before you go all “Ugly American,” download Word Lens. Using the built- in video camera on the iPad or iPhone, users can translate printed words in real-time. How does it work? Using the video-mode on the iPhone or iPad, users simply frame the word or phrase they wish to translate, and Voila! the translation appears on the screen. Buy “language pairs” to translate Italian, English, French and Spanish, or look up a translation by typing it into the app interface. No network is required, so don’t worry about traveling to remote areas. Nothing is perfect; but to ensure the best quality use the app on clearly printed text, like roads signs or menus. To keep the text in focus, hold the phone or tablet at least one hand-length away. Don’t get caught with your foot in your mouth aboard this holiday season instead use Word Lens. Joyeux Noël! Whether you’re a globe trotter or a forgetful flyer, don’t get caught at security rummaging through your bags for your flight itinerary. Instead, use Tripit to organize all your travel documents and accommodations. Packing is hard enough, and if you’re a woman, even harder. Tripit automatically organizes your pesky trip details into one itinerary that is available when you need where you need it. How does it work? When a user receives a flight or accommodation confirmation, the user then forwards the information to the apps e-mail, plans@tripit.com. 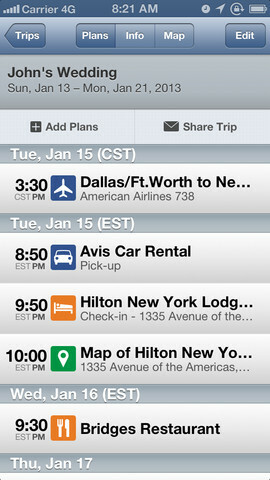 From there, Tripit does the rest, adding the information to your personalized itinerary available through a user’s iPhone, iPad or online at tripit.com. The app recognizes reservations from over 3,000 booking sites including cruises, restaurants, concerts and more. Planning a quick getaway or eloping to Vegas? Share your trip plans with friends and family directly, or share your plans through Facebook and LinkedIn. Even better, the Tripit Pro is perfect for those frequent flyers. For $49/year, this updated version monitors users’ flights, displays potential savings, and even sends users status alters and other helpful reminders. Plan ahead this holiday season with Tripit and avoid looking like a novice traveler. We can’t all be William Shatner or Santa Claus and fly around the world this holiday season for free, but with a little help from OnTheFly you can get to where you need to go, easily. OnTheFly, powered by ITA Software, gives users a sophisticated and all-inclusive way to shop for flights around the world. 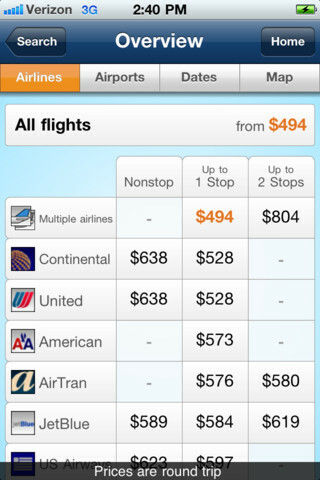 Using its user-friendly, savvy interface, users can search for available flights with excellent price-points. Search for airfare by sorting through an array of options including, price, departure time, arrival time, flight duration or number of permitted stops. The comprehensive interface displays chart summaries of your recent searches. The app even has a flexible airport selection, which automatically suggests nearby airports. Build the exact flight itinerary that you want with the apps calendar selection and get the exact airfare calculation including all taxes and fees. Although this app is everything a traveler needs, the app does not allow booking. Once a user selects their itinerary, they can e-mail the information or call a travel agent to make the reservation. Although booking within the app would be ideal, users can rest assured that they are indeed prepared for take-off. This holiday season arm yourself with these user-friendly travel apps and don’t end up like poor Kevin McCallister. Be sure to tune in next week for the next rendition of Apps on Tap. Safe Travels and Feliz Navidad!